← Treadmill For One, Garcon! You people in the big cities have no idea – NO IDEA – what those in the sticks have to go through to stay connected and keep up some semblance of sophistication. I was talking to my sister Terry the other day. She said she hadn’t checked my blog because her internet connection was down again. That COULD be true. I know she has had lots of trouble with her service in the past. She lives way out in the country. But I knew they changed providers just a few months ago. I suspected this was a flimsy excuse to avoid being grilled about my latest post. “Don’t you have DSL now?” I asked. “No, we’ve got Wi-fi.” Terry replied. I am not making up this next part – it’s practically a direct quote. “They put a satellite dish up on – you know our friend Henry Gilman? – the dish is up on top of his uncle’s corn silo.” Terry said. Yup. 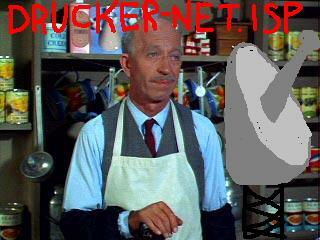 They got that new-fangled internet down at Sam Drucker’s General Store. Once you upgrade to Drucker-Net, your worries are over. The Drucker-Net sales manager, Mr. Haney, gave them a really good plan. They offer the Dee-Luxe Package for $29.99, but Terry thought that was a bit high, even with the Grabwell wringer-washer included. She chose the Party-line Plan for only $14.99. She just has to ring up Clara at the switchboard and she gets patched in to whatever site she wants. That is, if nobody else in the RFD is using the internet. Otherwise she has to check out whatever sites they check out. It’s called tandem surfing – sounds exotic! According to Terry, the only problem has been getting online late at night. Mr. Ziffel ties up the line for hours. He says he’s doing research on pork-belly futures. It’s some site called “Porking Porkers”. Outages are bound to happen, what with snow, wind or stray chickens. If things get cattywampus, Terry just calls the Drucker-Net service department. They are top-notch. Eb will be over in a jiff to shimmy up the silo and knock the dish back into place. With Drucker-Net, even the country mice will be as up-to-date on the latest technology as their city cousins. Just because you’re not urban, doesn’t mean you can’t be urbane. This entry was posted in General Ramblings and tagged country life, Green Acres, humor, internet, life, Petticoat Junction, technology. Bookmark the permalink. Of course Mayberry has all the modern conveniences. It is way bigger than Hooterville. It would be like their Mount Pilot! Eb would love to move the dish to the water tower, mainly because the Petticoat Junction girls are always skinny dipping in there. 10 points to you for making me laugh out loud! Me, too. Seems like I’m running in place, trying to keep up with the latest thing but falling further behind. Hilarious as usual, sis (I’m one of Peg’s other, urban AND urbane sisters). Urban is relative. See comments above vis a vis Hooterville, Mayberry and Mt. Pilot. Wow! I’m famous. Lucky for you my wi-fi IS working today. Nah, nah. And, no, she didn’t do anything to me at 12 years old … at least I don’t recall. Unless it was hogging the covers some cold winter nights. Made me laugh out loud, Peg. Hi Tar! Glad to hear you’ve got service now. If the hubby has to go out on the roof and hold an egg beater at 3 o’clock and an auger at 12 o’clock to get reception, it may be time to rethink the ISP. And it was ALWAYS you who hogged the covers. I was the sniveling brat who went and told on you to mom & dad. HOW MANY TIMES do I have to tell you girls to move down here in the South, to the BIG city of CHARLESTON so you can enjoy HIGH speed internet…and SUNSHINE!!! See ya soon! I guess I will need to bring my air card to get internet service up there for Ma’s 80th! Our 80+ parents actually DO have wi-fi at their place. Mixed up world. Hilarious Peg! Thanks for the stroll down memory lane. I agree with Jane…I miss my no tech childhood also. Thank goodness we all have young adult children to explain the intricacies to us!